Roleplay (RP) in NeoVictoria uses the Steampunk aesthetic and is free-form, with most preferring turn-based, para-roleplay. RP in NeoVictoria presumes you have a basic working knowledge of these ideas. NeoVictoria has its own history and backstory, much of which is posted to the public website. In-world our characters can read back issues of the NeoLondon Times to educate themselves. Our canon is unrelated to other storyworlds, or other Second Life SIMs. We do NOT cross storylines here. If you roleplay elsewhere, please do not bring storylines from those places here. We have a two-SIM estate in Second Life: NeoVictoria SIM and Machinima SIM. The sky-level is always out-of-character and the land level is always in-character. First, learn about the storyworld by reading our public website, or taking the in-world tour. Next, decide what kind of character you want to play and where in the Neo’Verse it’s from. Finally, equip a copy of our roleplay tool, then visit the land-level and start interacting with other players as your character. Roleplay is facilitated through the use of the NeoVictoria Roleplay Tool (NRT). It allows your typed chat to be seen SIM-wide, as well as giving your character its name/title, and access to the dice. Givers are in the final round of the Visitors Center and in the dirigible on the skylevel in NeoVictoria SIM, as well a several locations in the Machinima skymall. Wear or ADD this prim-object to your avatar and type /9menu for the menu of options. When needed, use the virtual dice that come with our roleplaying tool. Type /9menu into the local chat to use the dialog boxes to access the dice. Not every action needs to be played with dice. Emote the OOC alert ((Rolling DICE for outcome)) if you plan to throw dice. For COMBAT, the attacker throws dice and the defender roleplays the outcome. For COMBAT, the character being attacked always gets the next turn. The higher the dice roll number, the greater the probability of success. RESOURCE: The Complete Dice Rules at https://neovictoria.tv/rules/neovictoria-dice-rules/. 2) Who Are You People? We are a revolving cast of characters! Healers and con-men, fae and clockwerks, humans and …well, not humans. As with any roleplay community, some are more active than others; but all go towards creating the story of NeoVictoria. You are highly encouraged to join the in-world group, as well as the community website. They are both great ways to keep up with what is going on, meet your fellow players, and learn the history. Do I Have to Join your Group to Roleplay? When are the SIMs most active? Scheduled roleplay happens several times a week, often after 6 PM, SL-time, and are ‘hosted’ by different characters, but roleplay can (and does) happen at any time. If you have a storyline you’d like to work out, contact other potential players and get something going! May My Character Come from Outside of Your Storyworld? It may not. All new characters entering the roleplay must originate in the storyworld. If you need help figuring out how to make that work, chat with one of the mentors or GMs. What Kind of Races Do You Have? Strand Constructs (golems of pure machine consciousness). Creatures whose ancestors were born in the realms of Muspelheim (the realm of fire) and Jotunheim (the realm of ice). They are the slave-caste of the storyworld. Creatures whose ancestors were born in the realm of Nidavellir. Masters of metal work and stone craft, they were the architects and builders of the great wonders of the ancient world. Loam (protectors of the green places). The most populous race in the Empire and the back-bone of its military industrial complex. Therianthrops (mortal beings that simultaneously share human and nonhuman animal traits). Final round of the Visitor Center tour, with the teleporter that takes avatars to the land level. 3) What is Allowed/Not Allowed in NeoVictoria? As with anyplace, we have rules! You must be an adult to play in NeoVictoria. These are adult SIMs with mature, and sometimes very dark, themes. Anyone under the age of 18, and child avatars, are not allowed. No Exceptions. Be kind when OOC! ((Out of Character)) In character, people can act in aggressive, predatory, criminal and/or plain uncomfortable ways. If it makes you uncomfortable, let them know! Standard roleplay rules apply: no meta-gaming, and no god-modding. NeoVictoria is a privately-owned estate which Admin-approved machinima-makers use to make movies. By playing in the SIMs you are agreeing your avatar may be recorded as part of one of these productions, and you assign the rights to the video recording(s) and photograph(s) made of your avatar to the recordist/cinematographer/photographer. The FULL list of rules can be found in in-world in the Rules Notecard or the land covenant; an abridged list is posted here: https://neovictoria.tv/rules/. Please take the time to read them. You know how it goes: ignorance of the rules is no excuse, and we’d hate to have to ban someone over something that has been covered. The Auditor approaches the robot, ready to attach the scrambler to its damaged torso. Any issues, questions, instances of rules violations or any other concerns can be brought to the GM staff. [These are players with the “GM” tag in the NeoVictoria Roleplay Group.] Please be polite and straight-forward with your issue so it can be addressed quickly. How do I find a GM? We have call-boards in the Transportation Station on the Machinima side of the skymall. 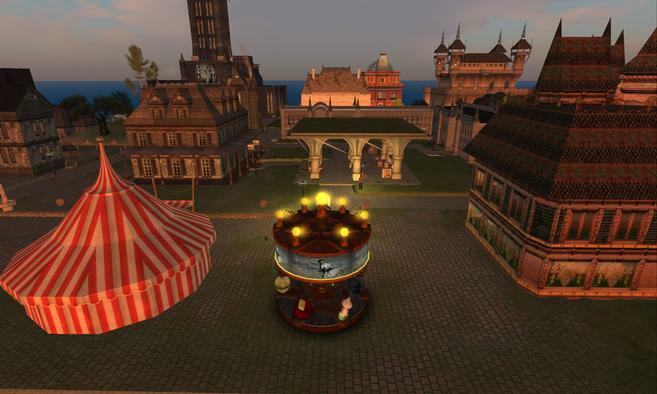 Or, you can reach out to any of the avatars listed in the NeoVictoria Roleplay Group; if you’re in-world, follow this link to see its INFO tab: secondlife:///app/group/b1595e47-0dce-5de8-9707-656562923a0d/about. If you have a problem with any member of the administrative staff, bring it to the attention of ASIL ARES only and PLEASE PUT IT IN AN EMAIL AND INCLUDE YOUR CHAT LOGS. Use the CONTACT FORM on the public website site: https://neovictoria.tv/main/contact-us/.